August 30: Up at 7:15 am, showered and at Allison's kitchen table by 8:00 am blogging away. Former brewer and old friend Jim Pericles stopped over at about 9:30 am with fresh tomatoes from his garden. Jim and I had a great time catching up for an hour, and I forgot to take a photo. Oops! Jim now works in the biotech industry. Then I blogged, packed, worked on photos and did a load of laundry. Finally at 3:00 pm, Allison said, "You have to leave or you'll never get to Cape Cod by 5:00 pm." So I drove off, a can of diet Dr. Pepper in hand. Arrived at Cape Cod Beer Company in Hyannis, Massachusetts just as a few dedicated homebrewers were showing up. 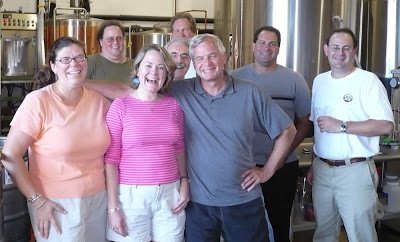 Owner/Brewers Todd and Beth Marcus had set up a little reception for the local homebrewers and regulars to meet me. In the photo above, L to R: Beth Marcus, John Brinkerhoff, Teri, Bruce Malin, Carl Layman, Paul Smith, Jim Migliorini and Todd Marcus. We hung out and talked beer & brewing, drank Cape Cod beer and ate snacks for a couple of hours. Everybody was really nice. It was fun to see my old friend Jim Migliorini who is a also a former professional brewer. Jim is now a school teacher on Cape Cod. Time was flying as usual on this trip, and as the sun threatened to set we hopped in Beth's car, Todd jumped in their new 20 foot antique Winnebago (affectionately known as "Winny-bagel" or "Brave Little Toaster" or "BTBTA: Brewery To Beach Transit Authority") and drove to the beach at Sandy Neck on Cape Cod. Here at Sandy Neck, people can drive cars and RVs on the beach. We don't get to do anything like that back in Oregon. 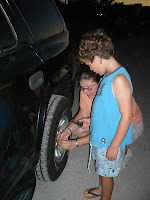 Before driving your vehicle on the beach, you have to "Air Down" or deflate the tires to 18 PSI. This keeps the vehicle from getting stuck in the sand, and it keeps the beach ruts from getting too deep. 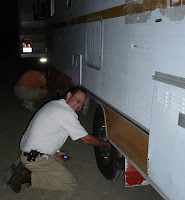 Photo at left and right show the Marcuses and their sons Jake and Harry deflating the tires on the car and the camper. A second cool thing you can do on the beach at Sandy Neck (besides just driving on it) is that you can park your self-contained RV on the beach Thursday night, and just leave it there for the weekend. That way you get a good parking spot before the place crowds up. After work on Friday you pack up the car, go back to your camper on the beach, and there you are for the weekend. 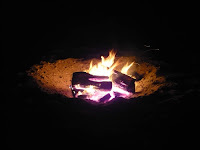 Another cool thing, which we can actually do on the Oregon coast, is that you can have a bonfire on the beach. The photo at right shows our lovely campfire built in a shallow dug pit. Everybody set up camp when we got there and Todd fired up the grill. We enjoyed hamburgers and hot dogs as we watched the moon rise over Cape Cod Bay. It rose rather quickly through the long fingers of gray-blue clouds, surrounded by the black star-speckled sky. The moon was just off of full. It's bright sepia color and tall oval shape reminded us of an old-fashioned hot air balloon rising into the darkness. It cast a lot of light over the beach. We could see cars and self-contained campers in both directions. After the Marcuses dropped me off at my camper at the brewery, I pulled in front of the entrance in order to plug in my extension cord. Not sure why, but I haven't had electrical in the trailer the last several nights. It was already midnight, but my husband Jon wasn't home from his job at Wyeast Laboratories in Hood River, Oregon, three hours away. I left a message and worked while I waited for his return call. I pulled my printer/scanner off the table under my bunk, moved the stuff that is "stored" on the bench seats while I drive, and tipped the table up sideways. That gave me access to the cases of beer that I have been collecting on this trip. I pulled most of the bottles out of the cases/12-pack carriers as I was a bit short on 6-pack carriers. Then I repacked the beers for future brewery gifts. I packed one bottle of my Steelhead Root Beer into each 6-pack. I'd bought several cases of it before I quit my job at Steelhead. Then I packed five different beers into each 6-pack carrier. My goal was to set up a bunch of mixed 6-packs. As I travel, I try to gift these mixed 6-packs to breweries in such a way, that the receiving brewery is getting beer they normally can't find in their geographic area, and the giving brewery's beers are "distributed" by me to brewers outside of their distribution area. Very fun for all the brewers and breweries involved. Thank you to Cape Cod Beer for letting me use their Internet to work on blogs and emails.